After tidying my desk somewhat during the past week, I had lots of 'stuff' I discovered again, including the die cut and the shaving creme patterned panel. I kept this card simple in design and with high contrast, as it is for an elderly person who suffers from Macular Degeneration, an eye condition that reduces vision severely, especially in the centre of the field of vision. Strong contrast does help them perceive things more easily. A close up of the panel and butterfly - I wanted clear rhinestones for the butterfly, but could not find them in my bin, until after I had attached the pink ones. I edged the top and bottom of the panel with a narrow strip of silver glitter card. I silver embossed the sentiment and then filled it in with silver ink, using a Stablio pen. the magical feature are the rhinestones on the butterfly. Oh lovely work Maxine, have been going to try this shaving creme malarky for ages now... One day :) love the way you Inked in the embossed outline of stamp, great card below too.. Love letterpress. Wonderful card Maxine.. love your textured butterfly on the marbled background! The contrast is beautiful. The little bit of glitter is elegant and your shaving cream background is subtle but showy. Thank you so much for taking time to post your very creative art with us this week at Word Art Wednesday in our 202nd AG challenge! congratulations for finding and using old stuff!! lol! beautiful card, i'm sure the extra thought you put into it for the recipient will be cherished. Shaving cream is a fun technique! Cute card. Thank you for joining us this week at Cupcake Inspirations. Gorgeous card! The background and the embossed butterfly are so pretty! Thank you for playing along in the Word Art Wednesday Challenge! Have a blessed day! Ooooh this is so pretty Maxine!!! Love your shaving cream panel and how you edged it in glitter paper! The butterfly really pops against the bg! One of these days I am going to try shaving cream! Your background is stunning! This is so gorgeous! Fabulous feminine creation! Thanks so much for joining us at Dragonfly Dreams and I hope you come back soon! Nothing beats a handmade card with lots of love, I am sure it will be much appreciated! Very beautiful card:-) Thanks for joining us over at Cupcake Inspirations Challenge this week! Such a beautiful card! 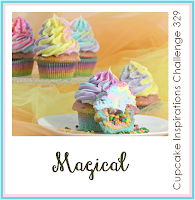 So glad you were inspired by our magical theme challenge at Cupcake Inspirations! Pretty! Thanks for joining in on my Amusing Challenge this week! A beautifully embossed sentiment on your make. Isn't it great what you find on a messy desk? I have been on a binge lately and all sorts of things are popping up! Love the shaving cream technique....I should make some more backgrounds someday! !